Santa Barbara Moorings: Trouble Staying Put? SANTA BARBARA — The 46 mooring sites east of Santa Barbara’s Stearns Wharf have been in high demand since the Santa Barbara Harbor Department introduced the field in 2006, but some boaters fortunate enough to acquire a spot for their vessel have claimed that their moorings have been more of a headache than an asset. However, boat owners said these “growing pains” are coming at a high price to them, with one specific type of mooring system — Seaflex — experiencing failures at an alarming rate. The permitted mooring field area, which is run by the Harbor Department, has placed ownership of each mooring in the hands of the boat owner. That means boaters pay a $250 annual fee to the city for use of the mooring field area and are required to pay for and install their own mooring equipment. The city holds an annual lottery for applicants to be chosen when new spots open up in the mooring field. More than 45 applicants signed up for the February 2011 lottery, in hopes of getting a shot at a less expensive option for keeping their vessel than a traditional Santa Barbara Harbor slip. While the city is not the owner of each individual boater’s mooring or equipment, mooring installation companies and mooring inspection agencies have to be city-approved for boat owners to utilize their services. Santa Barbara’s new, environmentally friendly mooring style was one of two approved by the city for use in the East Beach Mooring Program, utilizing a Helix anchor — essentially a large screw drilled into the ocean floor — that attaches to a series of rubber band-like cords intended to ebb and stretch more fluidly with tidal flows than a traditional chain-to-nylon rope catenary system, often anchored by a clump chain or a railroad car wheel. 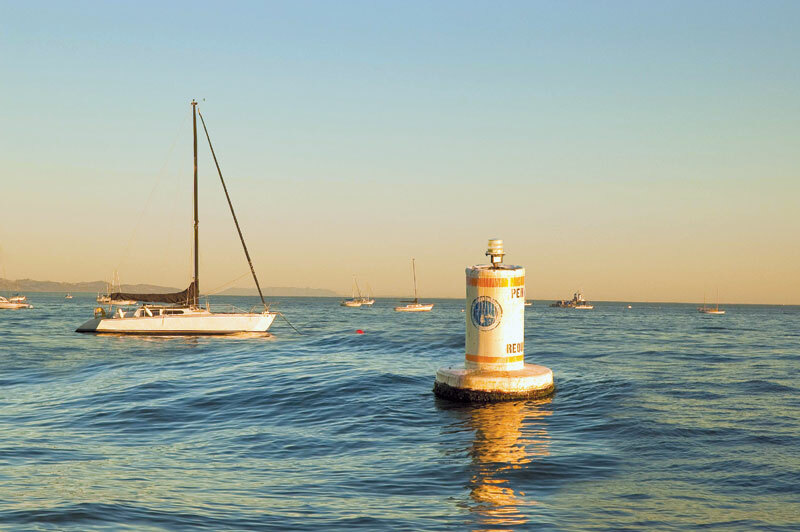 Benefits to the system include a smaller rode or radius than a traditional mooring system (about 3-to-1 instead of 5-to-1), meaning more boats can fit into a tighter area. Also, the Helix anchor leaves a much smaller footprint on the ocean floor, compared to a clump anchor, causing less harm to the marine environment. While the system has proved effective in many areas around the world, the results in Santa Barbara have had boat owners crying “foul.” Boaters have raised concerns about the integrity of the Seaflex equipment, the mooring inspector’s performance and the city’s lack of maintenance within the mooring field. Nicole Aversa, a mooring field permitee since 2009, had purchased the Seaflex mooring equipment for a higher price than the standard catenary system, expecting the longevity promised by the company to pay off over the long term. “I ended up paying a lot more for a lot less,” she said. The mooring ended up failing in January 2011, leaving her daysailer La Nina a mile offshore before it was spotted and towed to safety. When Aversa received the call that her vessel had broken free of its mooring, she found that the mooring was no longer operational and would need to be replaced. According to the mooring permitee contract, Aversa was required to have the mooring repaired within 10 days of its failure. But U.S. Mooring Systems Inc., which specializes in Seaflex mooring maintenance and installation, had canceled its status as an approved vendor for the mooring field prior to the annual inspection in Fall 2010. That left Aversa without a viable option for replacing and repairing the mooring. Aversa ended up anchoring her boat offshore, which resulted in a beaching a month later, and a lost boat. Aversa, who currently lives aboard a 40-foot trawler in a slip at Channel Islands Harbor, said she believes that both the lack of inspection of her mooring and the city’s allowance of lobster traps to be placed within the mooring field could both be responsible for her mooring failure. “After a $10,000 investment in Santa Barbara, we are paying for a slip in a public marina 40 miles south of Santa Barbara,” Aversa wrote in an email. Aversa is not alone in her complaints about the mooring system. Nine of the total 12 Seaflex mooring systems installed in the Santa Barbara field have failed — a number that has led the city to no longer allow the system to be installed in the mooring field. “I am one of those whose Santa Barbara mooring failed,” wrote California Fish and Game Commissioner Richard Rogers in an email to Seaflex marketing manager Brian Hylland, and to Kronman. Rogers, who owns a 50-foot Hatteras, did not regularly keep his boat on its mooring after hearing the troublesome stories regarding the mooring system and its failures in Santa Barbara. Aversa has reportedly filed a claim with the city to get reimbursed for the slip fees she is paying at Channel Islands Harbor since her mooring failed, along with mooring fees she paid while her mooring was inoperable. In addition, the situation has compelled owners of failed Seaflex moorings to band together and speak out against the Seaflex mooring system, the mooring installation/inspection company U.S. Mooring Systems Inc. and the city’s lack of response to their concerns. During the meeting, Harbor Commission chairwoman Betsy Cramer read a letter from Eric Schwartz, whose mooring failed as well, who claimed that installer negligence was one of the key reasons for the extensive mooring failures. The letter also mentioned the city’s slow response to Schwartz’ request to obtain contact information for the other Seaflex mooring owners. The Harbor Department has stated that the city attorney has not had time to review the request, which was sent in September 2011. “We need that info to complete analysis of the failures and proceed with recompense from the installer,” Schwartz wrote. “It’s concerning to me that this request was put in during September, and it hasn’t been answered,” said Harbor Commissioner Eric Friedman, who asked that it be pushed through as a Public Records Act request. Two fully functional Seaflex mooring systems remain intact in the mooring field, and they will be monitored closely by a newly approved installation and inspection company, to ensure that the systems keep working. The 14 Helix anchors that are embedded in the ocean floor will remain in place, and Kronman said he expects any new installations to utilize those anchors instead of the clump chain anchor.